Golden Grrrls will make you want to run off to the UK. Writing about music can get repetitive at times. There's only so many genres to use for classifying bands, unless you want to make up your own. One that I often feel like I use, almost to the point of overusing, is indie pop. But with Glasgow outfit Golden Grrrls, there's no term that could be more fitting. Although their name might bring up ideas of elderly women or lady punks, their sound fits in perfectly in the indie pop canon that features bands such as Talulah Gosh, Velocity Girl, and Television Personalities. To be honest, I didn't know a ton about indie pop until last spring and I'm still learning (people at my radio station are very serious about it – members of Black Tambourine and other pop bands did work there once upon a time). But everything I've heard so far I've fallen in love with, which makes Goldern Grrrls one of my new favorite bands. Golden Grrrls is the debut full length record by the band (composed of members Ruari, Eilidh, and Rachel) and is brought to us by Slumberland Records, which has consistently been the home of some of the best pop acts of recent and past years. The album is defined by sweet boy and girl harmonies and quick guitar riffs that are catchy as hell. 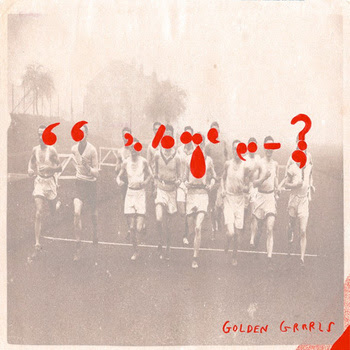 Golden Grrrls begins strong with the upbeat and slightly thrashing "New Pop", which sets the tone for the whole album. My personal favorites are "Paul Simon" with its plucky guitar and conversational vocals and "Wrld Peace" with its oddly beautiful intro hefty dose of "ooos". Golden Grrrls makes me want to run around outside in the sun and dance around my room when I'm supposed to be doing something else. Essentially, it's a half hour of pure indie pop perfection. Even though Golden Grrrls is usually based across the ocean, they're currently touring America so check out their tour dates here to see if they're coming to your city. Luckily they're coming through Baltimore for the city's Popfest, which will be a dreamiest day of music that the Mid-Atlantic has experienced in a long time. You can listen to a few tracks off Golden Grrrls here.